This series is about “the beast,” which, in this chapter, is only mentioned in verse 7. We will examine more than verse 7, however, because it’s necessary to look at the greater context of this verse. This will help us to validate the identity of the beast and to better understand his actions. I’ve developed a series of case studies comparing the works of Josephus and the book of Revelation. As the chart in that analysis shows, it would be very fitting for the events of Revelation 11 to have taken place in early 68 AD. “Now the angel who talked with me came back and wakened me, as a man who is wakened out of sleep. And he said to me, ‘What do you see?’ So I said, ‘I am looking, and there is a lampstand of solid gold with a bowl on top of it, and on the stand seven lamps with seven pipes to the seven lamps. Two olive trees are by it, one at the right of the bowl and the other at its left.’ … Then I answered and said to him, ‘What are these two olive trees…?’ So he said, ‘These are the two anointed ones, who stand before the Lord of the whole earth’” (Zechariah 4:1-3, 11, 14). In Zechariah’s vision, he saw one lampstand (Zech. 4:2). In Revelation 1:12 John saw seven lampstands, which he was told were the seven churches (Rev. 1:20). Here in Rev. 11:4 there were two lampstands, the two witnesses. I would like to propose that the two witnesses were two first century high priests, Ananus ben Ananus and Jesus ben Gamaliel (also known as Joshua). According to Josephus, they led the peace movement in Jerusalem when the Zealots were determined to rebel and incite war with the Romans, hoping to gain full independence for Israel. As we will see, their roles, deaths, the aftermath of their deaths, and the timing of their deaths line up with a number of details John saw in Revelation 11. Here is a short summary of these two men. 1. Ananus: The appointment of Ananus as high priest is recorded in Antiquities 20.9.1. He was appointed in 62 AD. Josephus called him “the ancientest of the high priests” and “a very prudent man” (Wars 4.3.7), “a prodigious lover of liberty” who “preferred peace above all things,” and “a shrewd man in speaking and persuading the people” (Wars 4.5.2). Ironically, in December 66 AD he was appointed as a general over Jerusalem, one of 10 generals appointed to prepare for war with Rome (Wars 2.20.3). A long speech given by Ananus against the Zealots is recorded in Wars 4.3.10. 2. Jesus: The appointment of Jesus as high priest is recorded in Antiquities 20.9.4. He was appointed in 63 or 64 AD, but only for about a year (Ant. 20.9.7). From that time on, Josephus said, Jerusalem was “greatly disordered” and “all things grew worse and worse” (Ant. 20.9.4). Josephus referred to Jesus as “a friend and companion” (Life 41.204), and called him “the eldest of the high priests next to Ananus.” Josephus added that “although he was inferior to [Ananus] upon the comparison, he was superior to the rest” (Wars 4.5.2). Jesus also gave a long speech against the Zealots, which is recorded in Wars 4.4.3. Ananus and Jesus were both killed at the same time during the Zealot Temple Siege of February-March 68 AD. This siege took place after the Zealots appointed a fake high priest, Phannias, who “did not well know what the high priesthood was” (Wars 4.3.6-8), and he unworthily presided over that post until Jerusalem was destroyed. In a sense, Ananus and Jesus represented the final lampstands, the final oil-bearing olive trees, of the temple before it was destroyed. “And now the people could no longer bear the insolence of this procedure, but did altogether run zealously, in order to overthrow that tyranny… The best esteemed also of the high priests, Jesus the son of Gamalas, and Ananus the son of Ananus, when they were at their assemblies, bitterly reproached the people for their sloth, and excited them against the zealots…” (Wars 4.3.9). In his speech (Wars 4.3.10), Ananus said that he would lead the people in an all-or-nothing attack against the Zealots, and that he would not spare his own body in that effort. In that battle, Ananus and his followers actually gained the upper hand against the Zealots, forcing them into the inner temple and gaining control of the rest of the city (Wars 4.3.12). Ananus then chose 6000 armed men to keep the Zealots surrounded and under guard. Unfortunately, as we will see, this strategy came undone because of the trickery of John Levi of Gischala (Wars 4.3.13-14). “Because you speak this word, behold, I will make My words in your mouth fire, and this people wood, and it shall devour them” (Jeremiah 5:14). For more on God’s word being like a fire, and having the power to “slay” people, see Jeremiah 23:29 and Hosea 6:5. “…and as for Titus, those springs that were formerly almost dried up when they were under your power since he is come, run more plentifully than they did before; accordingly, you know that Siloam, as well as all the other springs that were without the city, did so far fail, that water was sold by distinct measures; whereas they now have such a great quantity of water for your enemies, as is sufficient not only for drink both for themselves and their cattle, but for watering their gardens also” (Wars 5.9.4.409-410). Josephus said that Ananus had “the mastery of those that opposed his designs, or were for the war” (Wars 4.5.2). Josephus didn’t give many details about how he mastered his opponents, but this indicates that Ananus remained untouchable for a significant period of time even while the Zealots had their way in Jerusalem. Here “the beast” is mentioned for the very first time in the book of Revelation. (As we discussed in the previous post, it seems evident that John expected his readers to be familiar with Daniel’s description of the fourth beast in Daniel 7.) Here is also the first mention of “the great city” (later mentioned in Rev. 14:8; 16:19; 17:18; 18:10, 16, 18-19, 21). “The great city” is clearly defined as Jerusalem, the place where Jesus was crucified (e.g. Luke 9:31). It’s significant that the beast oversees the deaths of the two witnesses in Jerusalem. This has a bearing on whether the beast was Roman, as many suppose, or Jewish, which is the view I’m presenting in this series. As we saw in our study of Daniel, the Romans were not in Jerusalem from August 66 AD until April 70 AD, except for a few days in November 66 AD when Cestius Gallus led a failed attack on the city. 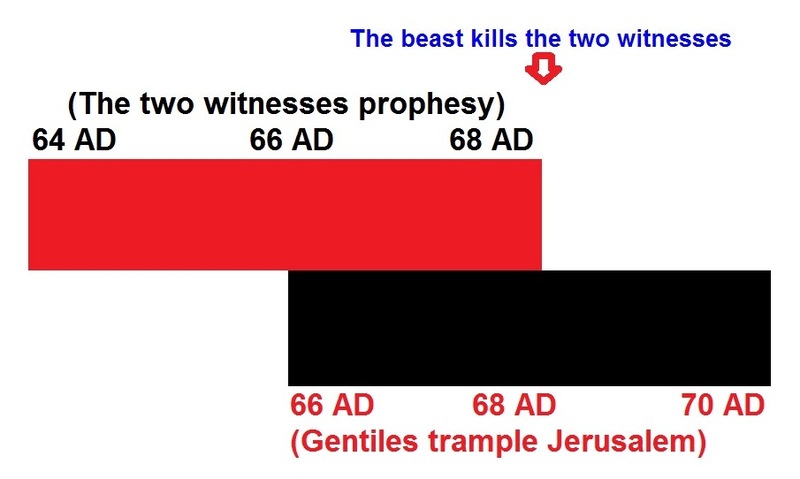 If the events of Revelation 11 took place anytime between late 66 AD and the spring of 70 AD, the beast that overcame the two witnesses was Jewish, not Roman. The events which I believe fulfilled this prophecy took place in February-March 68 AD. In February 68 AD, Ananus urged the people of Jerusalem to oppose the lawless Jewish Zealots who had taken over the temple as “blood-shedding villains.” John Levi of Gischala was a Zealot leader who had recently come to Jerusalem, but he pretended to be on the side of Ananus and was invited to be an ambassador to the Zealots (Wars 4.3.13). John quickly betrayed him and falsely claimed that Ananus had invited the Roman general Vespasian to conquer Jerusalem (Wars 4.3.14). When the Idumeans came to Jerusalem, at first Ananus’ guards prevented them from coming into the city. Jesus gave a speech in which he denied that anyone had betrayed Jerusalem to the Romans. He invited the Idumeans to help deliver the city from the real enemies, the Zealots, but the Idumeans were not persuaded (Wars 4.4.3-4). “[The Idumeans] sought for the high priests, and…went with the greatest zeal against them; and as soon as they caught them they slew them, and then standing upon their dead bodies, in way of jest, upbraided Ananus with his kindness to the people, and Jesus with his speech made to them from the wall. Nay, they proceeded to that degree of impiety, as to cast away their dead bodies without burial… I should not mistake if I said that the death of Ananus was the beginning of the destruction of the city… He…preferred peace above all things; …he was a shrewd man in speaking and persuading the people, and had already gotten the mastery of those that opposed his designs, or were for the war… And this at last was the end of Ananus and Jesus” (Wars 4.5.2). So John and Josephus both described two individuals in Jerusalem who were hated, basically invincible for a while, finally killed, and not allowed to be buried. The word “earth,” as we discussed earlier, often means “land,” i.e. the land of Israel. This is certainly the case here, as the two witnesses were based in, and killed in, Jerusalem. “Purim is a Jewish holiday that commemorates the saving of the Jewish people from Haman, who was plotting to kill all the Jews. This took place in the ancient Persian Empire… The day of deliverance became a day of feasting and rejoicing. Based on the conclusions of the Scroll of Esther (Esther 9:22): “…that they should make them days of feasting and gladness, and of sending portions one to another, and gifts to the poor.” Purim is therefore celebrated among Jews by: Exchanging reciprocal gifts of food and drink… Eating a celebratory meal… Other customs include drinking wine or any other alcoholic beverage, wearing of masks and costumes, and public celebration (Wikipedia: Purim). The deaths of Ananus and Jesus are commonly said to have taken place in February or March 68 AD. The Fast of Esther and Purim are typically celebrated from the 13th – 16th of Adar. In the year 68 AD, the last day of Adar was March 22nd, according to our modern calendar (“The Jewish war: a new tr.,” p. 191). Therefore, since each Jewish month was 29 or 30 days, we can know that the Fast of Esther and Purim took place around March 4-7 in 68 AD. It appears that when the Zealots celebrated Purim in March 68 AD, they not only celebrated the deliverance from Haman that took place in Esther’s day, but they also celebrated being free from Ananus and Jesus and all their efforts to oppose the Zealots and achieve peace with Rome. After all, they believed the lie told by John of Gischala – that Ananus had invited Vespasian to capture Jerusalem, and that Ananus intended for them all to be captured by the Romans. A short while later, another Zealot leader, Simon Bar Giora, found out that Ananus was dead. He was at Masada because Ananus had previously driven him away from Acrabattene, a toparchy of Judea, because of his tyranny there (Wars 2.22.1-2). When Simon “heard of the death of Ananus, he…went into the mountainous part of the country. So he proclaimed liberty to those in slavery, and a reward to those already free, and got together a set of wicked men from all quarters” (Wars 4.9.3). This is just one example of how the Zealots behaved as if they were free of the “torments” of Ananus and Jesus. “Now after the three and a half days the breath of life from God entered them, and they stood on their feet, and great fear fell on those who saw them. And they heard a loud voice from heaven saying to them, ‘Come up here.’ And they ascended to heaven in a cloud, and their enemies saw them” (Revelation 11:11-12). At this time, I don’t have much insight into what these verses mean or how they may fit the narrative described above (or any narrative described by Josephus or any other first century historian). Does this simply mean that heaven validated their message of peace? Did Ananus and Jesus embrace the gospel and become followers of Christ (something Josephus wouldn’t have mentioned)? I hope to gain insight on these verses in the future. In the meantime, those who read this are invited to share any insight you may have. “The zealots also joined in the shouts raised by the Idumeans; and the storm itself rendered the cry more terrible; nor did the Idumeans spare anybody; for as they are naturally a most barbarous and bloody nation, and had been distressed by the tempest, they made use of their weapons against those that had shut the gates against them… Now there was at present neither any place for flight, nor any hope of preservation; but as they were driven one upon another in heaps, so were they slain… And now the outer temple was all of it overflowed with blood; and that day, as it came on, they saw eight thousand five hundred dead bodies there” (Wars 4.5.1). Typically, estimates of Jerusalem’s population in the first century range from 30,000 to 100,000 people, so it’s very reasonable to conclude that 7000 deaths in 68 AD represented a tenth of the city falling. Even if the normal population was closer to 30,000, it would have been higher at the time of that earthquake if it took place around the festival of Purim. This was a minor festival, so the population may have doubled, but it wouldn’t have swollen to 250,000 or more as it would during the major festivals. After their deaths, the Zealots and the Idumeans “fell upon the people as upon a flock of profane animals, and cut their throats.” Others endured “terrible torments” before finally meeting their deaths. At least 12,000 died in that massacre (Wars 4.5.3). In summary, Ananus and Jesus were two former high priests, and the most prominent of the high priests during the Jewish-Roman War. As such, they fit the Old Testament imagery of olive trees and lampstands representing those who stood before the Lord in the service of the temple. Until the time of their deaths, they were immune to the harm that their enemies wanted to inflict upon them. They gave speeches predicting the destruction that would come to Jerusalem because of the Zealots and due to the rejection of their message of peace. Jerusalem experienced a drought during that time. They were killed by the Zealots (and their cohorts, the Idumeans) just as the Zealots gained full control of the city. They were not allowed to be buried, and their enemies rejoiced over their deaths. This happened at the same time as an earthquake and the deaths of 8500 people. In the next post we will begin to look at Revelation 13. Adam, I appreciate your work and insight. As I contemplate these things, I ask, what are the things necessary for salvation of today’s Christians? It seems to me that understanding Revelation is not necessary. Bible scholars are indeed interested and find this work joyful. Of course, all of us want to carry the correct message when we evangelizing. Most Christians speak of doom and gloom. We preterists speak of joy, happiness, that the great destruction has been accomplished. We now look forward to a great rebuilding and a return to Paradise under Jesus as ruler overall. I do look forward to reading your blog and I encourage you to continue. “Now after the three and a half days the breath of life from God entered them, and they stood on their feet, and great fear fell on those who saw them. And they heard a loud voice from heaven saying to them, ‘Come up here.’ And they ascended to heaven in a cloud, and their enemies saw them” (Revelation 11:11-12). …… I have read somewhere that when Nero was building some water course or something and digging somewhere there, that blood came out of the ground at the time and they saw spirits/ghosts coming out of the ground and rising up. I can’t find it at the moment but it is recorded in history. Nero died in 68AD from suicide. Maybe that could have been when Hades was emptied out and the Old Covenant saints (Daniel etc) rose in the resurrection of the dead. Just a thought.. It would have been perfect timing because the true Christians had fled Jerusalem and gone to Pella and the whole place was about to be made desolate. The seventh trumpet sounded immediately after that and the Kingdom proclaimed. Hi Lyn. I’m not sure where that account concerning is. I don’t believe it’s in any of Josephus’ writings, so I wonder if that came from Tacitus, Suetonius, or Dio Cassius. Looks as if you’ve covered this connection pretty thoroughly between Josephus’ record of the Idumean attack and the Revelation 11 passage about the two witnesses (the 6th trumpet). Are you interested in a few more verses in Revelation that are also related to this story about the Idumeans coming to Jerusalem to oppose Ananus? Until recently, I had been uncertain why John emphasized the Euphrates River in Revelation 9:14 as the location where the 4 “angels” (those 4 Idumean commanders) were bound. Another mention in Revelation 16:12 of the Euphrates being dried up for the 6th bowl judgment was also puzzling. Then, while skimming through someone’s comments on another website about the significance of the Euphrates River in Revelation, the light bulb went on for me. The “Euphrates River” mentioned in both Revelation 9:14 and Revelation 16:12 is meant to be symbolic. Jerusalem, as you know, is equated with Babylon the Great in Revelation. Therefore, since the main water supply of ancient Babylon was the Euphrates that ran through the city, that means the main water supply for Jerusalem / Babylon the Great would symbolically be called the “Euphrates River”. When we read in Revelation 16:12 of the “Euphrates River” being “dried up”, it means that the main water source was dried up for Jerusalem (a.k.a. Babylon the Great). Adam, you have already mentioned in your post above the period of NO RAIN which took place during the 2 witnesses’ time of testimony (Rev. 11:6). You made the connection of this time with NO RAIN to the drought Josephus brought up in his speech to his fellow-Jews over the walls of Jerusalem. On that occasion, he was pleading with them to surrender to the Romans before it was too late. As you mentioned, Josephus reminded them in Wars 5:9.4.409-410 that the water of the Siloam spring and the other springs around Jerusalem had suffered during the Zealots’ time of influence in Jerusalem, but that once Titus showed up, the springs had resumed their abundant flow, just in time to serve the Romans’ needs for the siege; surely a sign of God’s favor to the Roman cause, he thought. He warned them that this phenomenon was merely a repetition of a similar drought which had occurred in Jerusalem before it fell under the Babylonian siege – a drought which the prophet Ezekiel had foretold with his diet of defiled bread and rationed water (Ezekiel 4:11,16). When we read this account of Josephus, we are merely reading the fulfillment of Revelation 11:16’s prophecy of NO RAIN during the 1260 days of Ananus’ and Joshua’s testimony, and also the fulfillment of Revelation 16:12’s prophecy where the “Euphrates” was dried up. As to the reason WHY the “Euphrates” was dried up, we are told in Revelation 16:12 that it was to prepare the way of the kings from the east. At first glance, this sounds as if the kings themselves were coming from eastern countries. After looking at multiple translations of this, though, it appears to me that we are looking instead at A WAY FROM THE EAST which was prepared for these “kings”. In other words, the “way” for these “kings” to get into Jerusalem from the EAST SIDE OF THE CITY had been prepared by God for a particular purpose. Here is how this verse connects to the Idumean nighttime attack. We are told in Revelation 9:15 that these 4 “angels” (the 4 Idumean commanders) were “bound” at the “great river Euphrates”, and then “loosed” to kill a third of men (this third of men being Ananus’ one faction out of 3 factions in Jerusalem that was eliminated). This is exactly what happened with the Idumeans. Ananus and his guards closed the main gate of Jerusalem against the approaching Idumean army of 20,000 and blocked their entrance into the city. This was what “bound” them at the “Euphrates”. Then, during the night, God had “prepared” that particular hour, day, month and year on the calendar for the Idumean army and its 4 commanders to be “loosed” into the city to slay all those of the moderate party of Ananus that they could find. The WAY TO ENTER JERUSALEM FROM THE EAST SIDE WAS PREPARED for these “kings” when the Zealots sawed open the bars of the eastern gate of Jerusalem for them. This “loosed” the Idumean army into the city under cover of the noise from the nighttime storm and earthquake that God had provided for the occasion. Do you remember Daniel’s story of Belshazzar’s feast and how Babylon fell in that one night when the handwriting on the wall appeared? The man who had been prepared by God for that invasion of Babylon was Cyrus the Persian. His army, under cover of night, broke into the supposedly impregnable city. He had earlier diverted the flow of the Euphrates into multiple channels so that the water level sank low enough for his army to go beneath the walls of Babylon through the water gates of the Euphrates. This strategy of Cyrus was not anticipated. It took the unsuspecting Babylonians who were in party mode that night completely by surprise. Josephus tells us that Isaiah’s prophecy concerning Cyrus’ activities was given 140 years before the temple at Jerusalem was ever demolished (Ant. 11.1.2). In Isaiah 44:27-28 and 45:1-4, God called Cyrus expressly by name, and foretold extremely detailed instructions of what actions Cyrus would perform as God’s “anointed” shepherd. God promised to “DRY UP THE RIVERS”, (the Euphrates) and to “loose the loins of kings” for Cyrus sake (as happened to Belshazzar in Daniel 5:6). Then He would open before Cyrus “the two leaved gates” (the water gates of the Euphrates at Babylon), saying “the gates shall not be shut”. Furthermore, God promised Cyrus He would “break in pieces the gates of brass” for him, and “cut in sunder the bars of iron.” It all sounds eerily similar. Daniel’s ancient story of Cyrus’ one-night takedown of Babylon and the Chaldean empire was mirrored by the Idumeans’ one-night takedown of Jerusalem’s / Babylon’s moderate high priesthood party. Just as Belshazzar the king was slain that very night Cyrus broke into Babylon unexpectedly, in similar fashion Ananus and Joshua,( the 2 witnesses and former high priests / kings), were slain in the same hour of the earthquake when the Idumeans were unexpectedly “loosed” on Jerusalem through the eastern water gate. Knowing his readers’ familiarity with this story of Babylon’s fall from Israel’s past, John used the name of the River Euphrates to jog their memories of how Old Testament Babylon had met her fate in Daniel’s days. That Babylon had died, never to regain her status as an empire again. Jerusalem as “Babylon” in the end of the Old Covenant Age would also die – her “Second Death” to be exact ‘ and would be “found no more at all” (Revelation 18:21). The death of her last high priest “kings”, (the 2 witnesses, Ananus and Joshua), was intended by God to eradicate the formerly-approved Zadok high priesthood for all time, leaving Christ’s ultimate high priesthood to stand alone without a rival. You had asked above (in the section devoted to Rev. 11:11-12) if Ananus and Jesus ever embraced the gospel and became followers of Christ. I can see how you would question that – it does seem as if that would be improbable for Ananus to have done a complete 180 degree turnaround after being the main one responsible a few years earlier in AD 62 for bringing Christ’s brother, James the Just, before the Sanhedrin and then having him executed. It would have been a rather abrupt conversion for Ananus to have changed so completely so soon. However, Saul’s / Paul’s conversion was even more dramatically sudden on the Damascus road, so we know that “with God, all things are possible” – even a conversion for Ananus. The following provides some indications that Ananus might have done an about-face after he had supervised James the Just’s execution. I’ve been looking at Zechariah 13 lately, especially that whole section about the prophet whose parents “thrust him through when he prophesieth”. On the surface, the language in that one section seems totally out of sync with the entire surrounding context of Jerusalem’s destruction and all the prophetic details taking place “IN THAT DAY” – in the process of Jerusalem being brought down. Then I checked some of the LXX translation of Zechariah 13:2-7, and realized that this segment of the prophecy must be talking about Ananus and Jesus, who were the 2 prophets, or witnesses of Revelation 11. Here are my thoughts on that Zechariah 13:2-7 section. Feel free to correct this where you think it goes totally off-track. The “father and mother” of Zechariah 13:3 that accused the prophet of LYING in the name of the Lord were symbolic for the fellow ethnic Jewish citizens which were the national family of Ananus and Jesus – the nation which had “given birth” to them. In other words, this represents the time that John of Gischala convinced the Zealots that Ananus had LIED and was intending to surrender the city to Vespasian and the Romans. This is why the “father and mother” of the prophet would “thrust him through” when he prophesied, just as the Zealots killed Ananus and Jesus just after Jesus’ speech from the wall of Jerusalem to the Idumeans the day before they broke into the city during the night of the storm. Zechariah 13:4-5 (LXX) is where it appears that this prophet (Ananus) repented for his past actions of having Christ’s half-brother James killed back in AD 62. “And it shall come to pass in that day, that the prophets shall be ASHAMED every one of his vision when he prophesies; and they shall clothe themselves with a garment of hair because they have lied:” This is the same sackcloth worn by the 2 witnesses in Revelation 11:3, which symbolically showed repentance and / or national distress. Did Ananus repent of having lied about James the Just when he accused him before the Sanhedrin of transgressing the law? (Ant. 20.200) This verse would seem to support that. Perhaps, since these 2 witnesses were of the Sadducee party, they were ashamed because they had not formerly believed in a resurrection of the dead, neither in the existence of angels or spirits, and had been responsible for teaching this error to their fellow Jews (Acts 23:8). One of these prophets in Zechariah 13:5 (LXX) admits that “I am not a prophet, for I am a tiller of the ground, for a man brought me up thus from my youth.” This might be descriptive of the more humble background for Jesus ben Gamaliel, since the Talmud claims that this man was no scholar, and did not have the title of “rabbi”. His attainment of the high priesthood only came after his wife Martha of the Boethus family (one of the wealthiest women in Jerusalem at that time) had bribed Agrippa II to gain the appointment for her husband. Apparently, this man did have a sympathetic concern for the common class youth in Israel, because he is credited with starting a virtual “public school” system of education for young Jewish children in every district and town, instead of just in Jerusalem. He sounds rather like a “man of the people” type, who may have grown up with a poorer background than was usual for a high priest’s family. In the very next verse (Zechariah 13:6), the Lord says that He will ask this one prophet “What are these wounds between thine hands?” And the prophet (Jesus ben Gamaliel) answers, “Those with which I was wounded in my beloved house.” That sounds very much like a resurrected Jesus ben Gamaliel testifying about his own murder by the Zealots somewhere on the grounds of his own beloved temple in Jerusalem. Next, (in Zechariah 13:7 LXX), God announces this: “Awake, O sword, against my shepherds” (Ananus and Jesus, the former high priests over God’s flock) “and against the man who is my citizen, saith the Lord Almighty: smite the shepherds” (the murder of Ananus and Jesus during the Idumean attack) “and draw out the sheep: and I will bring my hand against the little ones.” These “little ones” would be the children of the weeping women who encountered Christ on the way to the cross. Christ told them to weep for their children and themselves instead of Him, since He knew what fate was in store for their “little ones” in Jerusalem’s and Israel’s final days. According to Zechariah 13:8-9, a full 2/3 of the people “in all the land” of Israel would be cut off and perish in those final days, but 1/3 would emerge after being brought “through the fire” (the fire that would “burn up the chaff” – Matt. 3:12). Were Ananus and Jesus actually brought into God’s presence in heaven after their physical resurrection in the streets of Jerusalem? In Revelation 11:12, they were told to “Come up hither” and they went to heaven in a cloud. However, I don’t think that it’s possible for them to have gone all the way to the “third heaven” and into God’s presence, because the temple in heaven would not be available for any man to enter it until the 7th trumpet / the 7th bowl judgment was fulfilled (cp. Rev. 15:8 with Rev. 11:19). That would mean these 2 witnesses (who were raised at the end of the 6th trumpet / the 2nd “woe” in Rev. 11:14) could not have ascended into God’s presence yet until the next 7th trumpet judgment had ended. So, if Revelation 11:12 says they “ascended up to heaven in a cloud”, it had to have been in the same manner that Elijah “was taken up in a whirlwind AS IT WERE into heaven” (IV Kings 2:1,11 – LXX). In reality, Elijah was only transported to another location on earth, unknown to Elisha, where about 10 years later, Elijah wrote his prophetic letter to King Jehoram found in II Chron. 21:12. The same type of transport must have occurred for the 2 witnesses, Ananus and Jesus, to another location on the earth at that time. They wouldn’t have had to remain on the earth very long after AD 68, though, because all the physically-resurrected saints were taken into God’s presence on the day of Pentecost in AD 70, only a couple years from then. Only God knows if He considered Ananus and Jesus ben Gamaliel to be included among the number of the saints, but it sounds likely.